Yesterday, we started this series by visualizing a childhood experience.To get the most out of today’s discussion, we highly recommend that you read this prior blog before you proceed. Today we’ll jump to the future, to help you visualize the life you want. Before we do that, though, let’s look at three constraints that we all face. We’re trained to believe that money is limited. And it is —at this point. But this may surprise you. You can get more money! In fact, we bet you plan to get more. So money is limited, but there’s an even bigger constraint. What, you ask, is that? Yes, we can get more money, but we can never get more time. We can only manage the time we have better. Every day, we’re given 86,400 units of this most precious resource. Every second, one unit of it is gone forever. Do you hear that sound? That’s the sound of time ticking away. However, we still haven’t considered the biggest constraint of all. By far, the biggest constraint we face is the limitations we put on ourselves. Think about it. How often do you tell yourself that you can’t do something? We spend so much time focusing on what we can’t do, that we fail to see what we can do. Get your child-like wonder back. Think like a kid again. Imagine the possibilities. how would you spend your time and your money? Think about it. Dream. Dream like you did when you were a kid. Imagine the possibilities. Use all of your senses. Get a clear picture in your mind. Envision your passions. See the life you want to live. Write down your dream. Repeat this visualization every day for the next 30 days. Edit your narrative. We’ll come back again in about a month and discuss how to use your talents to get the future you envision. Our quote today is a paraphrase of Robert Kennedy, paraphrasing Ralph Waldo Emerson. So we say to you — why not? Why not imagine the life you want? 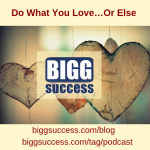 In our next blog, we’ll discuss the single biggest barrier to your success.